In our work here at the Joe Andruzzi Foundation, we hear many touching stories and meet a lot of very determined, inspirational people. Few we’ve encountered have pulled at our heart strings like 4-year-old Malia Jusczyk. 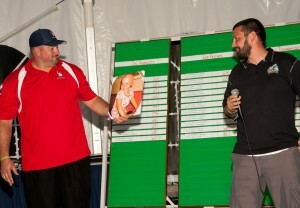 We were honored to hear her father Glen share Malia’s story at our recent golf tournament. And grateful to play a small part in helping the Jusczyks fight their daughter’s cancer. Malia was just two-and-a-half years old when she began suffering from intense stomachaches last March; at the time, her family – originally from Massachusetts – lived in Florida. Malia was in pain for weeks, growing more and more withdrawn and listless, her dad said. Her mom, Megan, knew something was really wrong. “It was a mother’s intuition,” Glen said. The first doctor visit led to misdiagnosis. But a middle-of-the-night follow-up ultrasound at her parents’ insistence showed little bumps on her kidney. Doctors thought it might be a urinary tract infection, but Malia’s mother took her to a nephrologist – a kidney specialist. He ordered a scan and warned them “there was a minute chance it could be cancer,” Glen remembered. 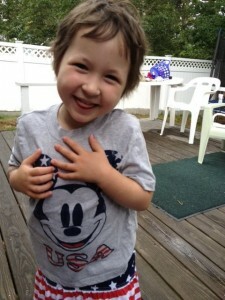 The scan revealed a devastating diagnosis: Neuroblastoma, a cancer of the nervous system. Malia had a tumor the size of a grapefruit in her stomach, which had flattened like a pancake. And it had spread into her spinal cord. “The doctor told us, ‘You’re going to be here a long time,’” Glen said. Neuroblastoma is one of the most common cancers in children, but a Stage 4 diagnosis is rare. Malia’s cancer was in her bone marrow, femur and spine. It had killed her adrenal glands and right kidney, and it was growing fast. The family finances were thrown into chaos, as they struggled to keep their home in Florida and reestablish themselves in Boston. They needed a place to stay near the hospital, and the Ronald McDonald house served as a temporary home base. But after 45 days, Malia was still in the hospital and the family needed an apartment. Megan was able to keep her job as a pharmaceutical rep, but Glen’s construction work was on an indefinite hold, as he became Malia’s primary caregiver. “One of us needs to be with her at all times,” he said, echoing the struggle that many families fighting cancer immediately face. That’s where our foundation came in; Glen and our family share a mutual friend, who passed him a grant application. “At first I thought, we won’t need this,” Glen said. “But as our time at the Ronald McDonald house ran out, and we needed to rent a place, it came in handy.” Glen says our offer to pay the family’s first month of rent in Brookline “came at just the right time.” We were glad to help. The apartment enabled Glen and Megan to stay close to Malia, as she underwent treatment at Children’s. She finished her chemo on her third birthday – June 26, 2011 – and got to have a huge surprise party there. After months of procedures and treatment, Malia was finally discharged from Children’s, but restricted to three months of isolation. By this time, the family had moved to the Cape. “It was just Mom, Dad and Malia,” Glen said. “It was tough.” Family could visit, but had to stay in a heated area outside. The visiting nurse had to wear a mask, booties and gloves. Malia’s chemotherapy and surgery was followed with radiation to her tumor bed. She also had her kidney removed prior to her stem cell transplant. A recent scan of the tumor bed showed no cancer, but doctors are still examining a questionable spot on her back. Her kidney and thyroid functions also aren’t good, so her family remains cautious and hopeful. A few weeks ago, Malia and her family visited Michigan and enrolled her in a ground-breaking study with Neuroblastoma expert Dr. Giselle Scholler. The trial aims to develop a medicine that may keep the disease from recurring or spreading. For Glen, Megan and Malia, it’s been a long road… and it’s not over. Malia’s growth has been stunted, she needs speech therapy and counseling, she still has a tube in her chest and she’s lost hearing in both ears. Her family hopes her participation in the Michigan trial will help her, as well as other children. As for Malia, she just wants to go swimming. She asks her parents to take her to the beach, just so she can watch the other kids play in the water. “She loves to swim, and she can’t wait to do it,” Glen said. We hope this beautiful and brave little girl gets her wish soon.